The Holy Spirit Dove Black Diamond Engagement Ring Set is a genuine statement of love for a bride of sophisticated taste. Its 14K white gold construction adorned with a precious black diamond encased in the wings of a solid gold dove is a striking and unique way to say I love you. This exceptional ring holds a 5mm black diamond jewel in its center, creating an earthy reflection as the light catches on the round-cut surface. Looking into the dark gem is like an endless pool of deep devotion. 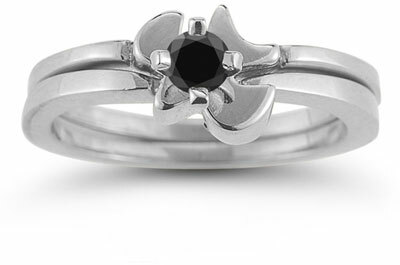 A white gold dove at the center of the design perfectly complements the black diamond, further drawing the eyes in. Together, the black diamond and white gold create a showpiece to be praised. The gold bands measure 2.8mm each. This ring set is a complete jewelry piece to accompany the bride during her engagement. Designed for refined taste, it's light and dark contrasting materials work together to create a perfect Zen harmony. We guarantee our Christian Dove Black Diamond Engagement Ring Set, 14K White Gold to be high quality, authentic jewelry, as described above.